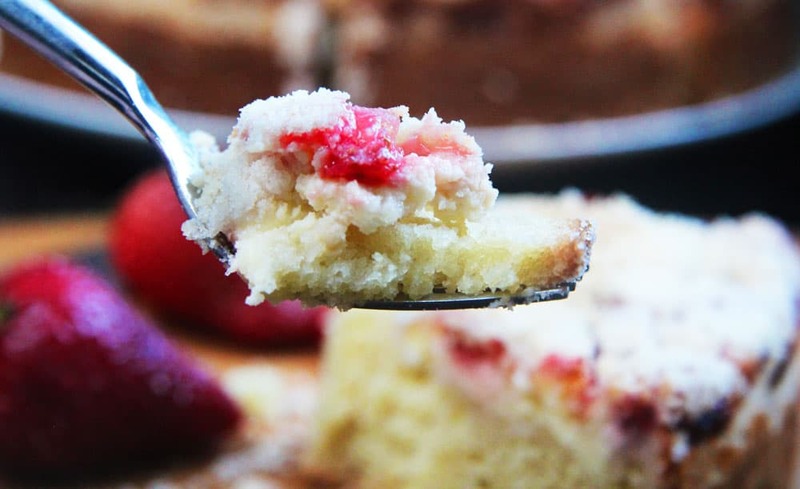 I love how coffee cake makes eating cake for breakfast acceptable. 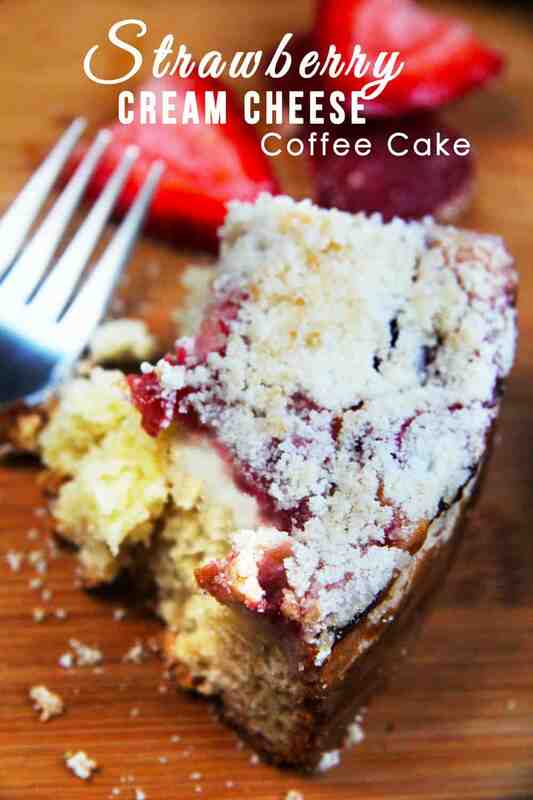 …when you take advantage of eating cake for breakfast by eating this coffee cake for breakfast! 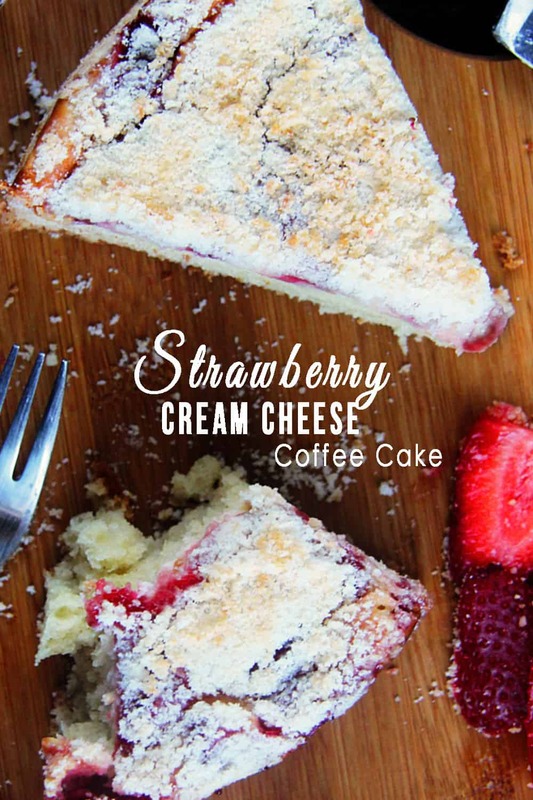 Each and every bite of this Strawberry Cream Cheese Coffee Cake is comprised of buttery, moist coffee cake, layered with velvety cream cheese, fresh sweet strawberry jam and buttery sugar crumb topping – did I mention that was in every bite? Because strawberries and cream cheese should never be separated. They belong together, always and forever. They go together like peanut butter and jelly, like fettuccine and Alfredo, like Patrick and me – wait, too cheesy, like, Beef and Broccoli and rice. Patrick said he could finish the cake. That means this is one incredibly delicious cake! 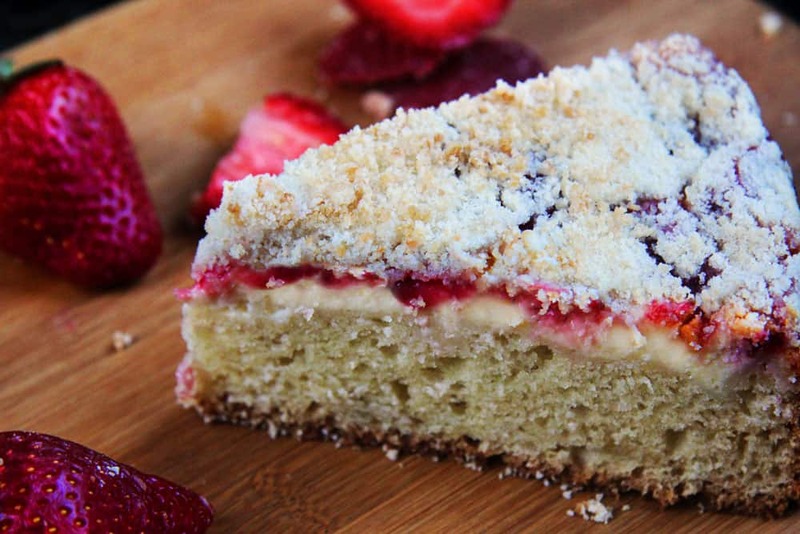 Leftover Strawberry Cream Cheese Coffee Cake and Patrick go together. 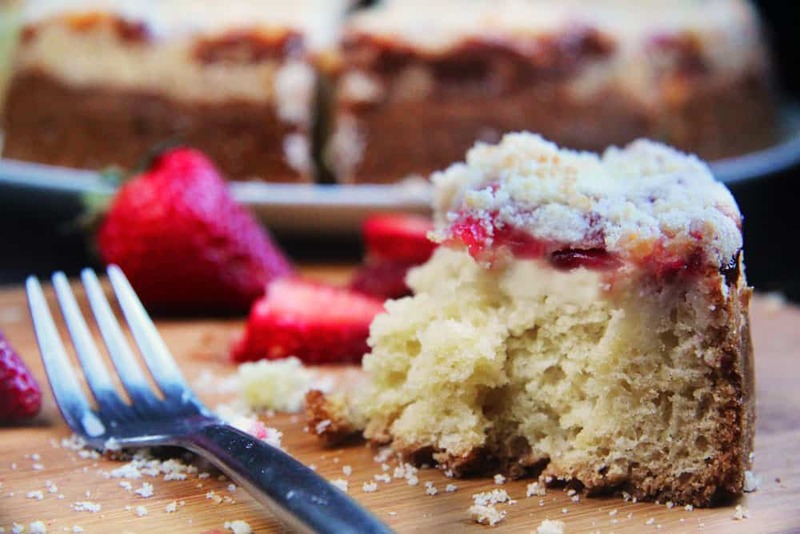 Just like coffee cake and breakfast go together. 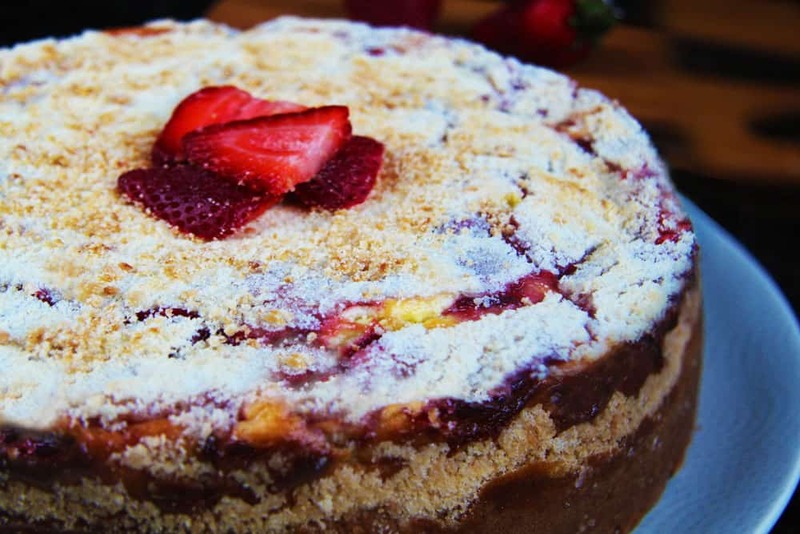 Now you can eat breakfast and have your cake too! Preheat oven to 350F. Line an 8” inch round 3" deep spring form pan with parchment paper and spray with nonstick cooking spray. 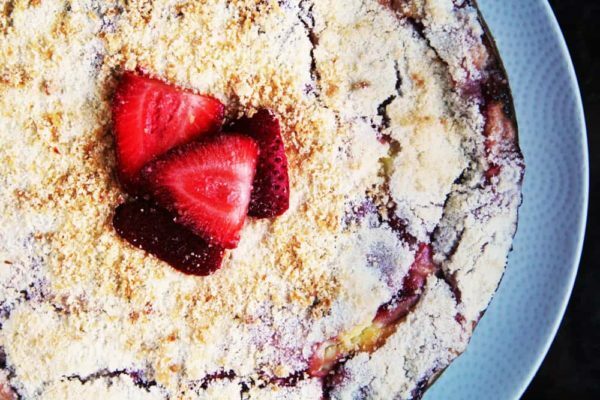 Add all of the “strawberry filling” ingredients to a medium saucepan. Cook over low heat for 5 to 7 minutes, stirring constantly until the filling is thickened and strawberries are soft and somewhat broken down. Set aside to cool. Beat the cream cheese on medium speed for about 30 seconds until smooth. Add in 1/4 cup sugar and 1 egg and beat until well combined. Set aside. To make the cake, combine the flour and sugar together in a bowl. 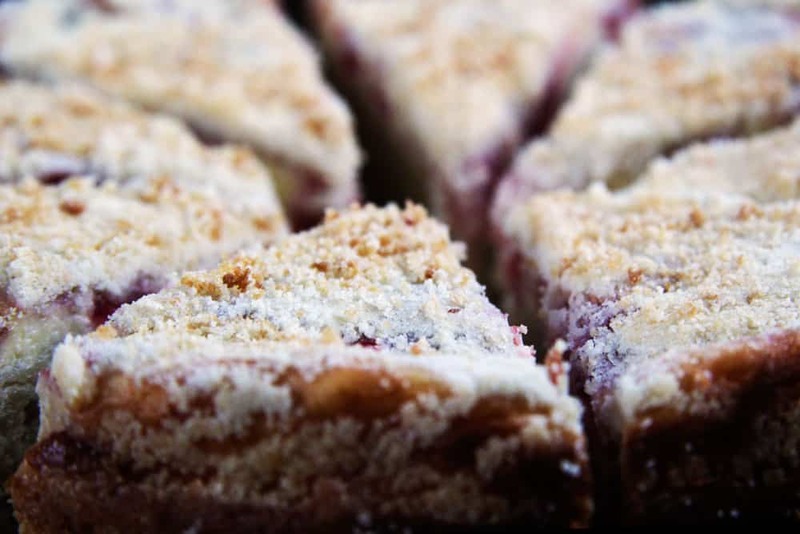 Using a pastry cutter, 2 forks or your food processor, cut in the butter until the mixture resembles coarse crumbs. Measure 3/4 cup of the mixture and set aside. Add the baking soda, baking powder and salt to the remaining mixture and mix well. In a separate bowl, beat the sour cream, egg and vanilla extract until well blended. Using a hand whisk or a spoon, gently stir in the flour mixture until just incorporated. Batter may be a bit lumpy. Set aside. Spread the batter in the prepared pan, pressing about 1/2 inch of batter up the sides. Pour the cream cheese mixture over the batter and spread to within 1/2 inch edge of the batter (so there is a 1/2 inch border of uncovered batter all around). Spread the strawberry filling on top of the cream cheese mixture. 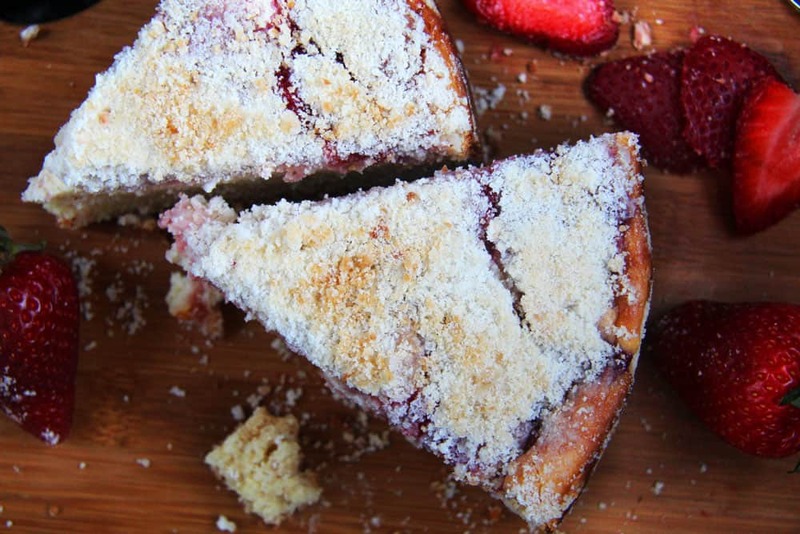 Sprinkle the remaining 3/4 cup crumbs over the strawberry filling. Bake for 50-55 minutes. Cool in the pan on a wire rack for 20 minutes before removing the cake. This is a coffeecake meant to be eaten for breakfast or brunch so it is not overly sweet - but just right. This looks delicious! I’m a little confused about the cornstarch in the Strawberry Filling ingredients – is it 2 tablespoons or tspns. cornstarch dissolved in 1 water? in how much water? If you could clarify, I would appreciate it! Thanks! My Apologies! I had all my recipes transferred to a new format and it looks like this did not transfer correctly – it should read “2 teaspoons cornstarch dissolved in 1 tablespoon water.” I updated the recipe – sorry about that! Hope you love it! What a kind comment, thank you so so much Tatum! Thank YOU for making them! I love hearing that you are enjoying them! I am not one of “those” people who completely rewrite a recipe and then review it. However, I thought I’d share a dilemma and how your recipe came to the rescue. I coarsely chopped the pieces and subbed them for the strawberries, keeping everything else exactly as you have it, just a bit less sugar in the fruit layer. OMG!! While there’s nothing better than cream cheese and strawberries, the pineapple comes in at a close second. Thank you for the fabulous recipe! Hi Vicky, I am so happy you took the time to comment! What a fabulous idea to use the leftover chopped tidbits in this cake – you are making me eager to try that version as well! I’m so happy this recipe came to the rescue and you’ve also given me new inspiration so thank you!